Social media has become a powerful medium to communicate and navigate in the social circles. It also provides an excellent platform for news sharing, creativity display, and learning. Observations suggest that on average 50-75% of the teens around the world have online connectivity via computers or phones and 73% of them use social networking on regular basis. Similar to all the technologies on this globe, social media has also got its positives and negatives. Social media helps the teens to extend their friendship to people in different areas of their life like school, sports groups, young scientists, religious groups, and many more. This helps them to feel connected, allows them to have varied experiences and therefore make them feel more happy, alleviated, and encouraged. Social media allows teens to share their knowledge about various aspects of life and culture, which make them feel valued and important. Social media acts as an important support system for the teens from the marginalized community like lesbian, gay, transgender, with chronic illness, and physical or mental disability. Teens feel more comfortable and safe while discussing their health problems or queries on social media as compared to their peers or parents. Studies suggest that teens with phones and computers with connectivity to social media feels more liberated and independent without losing touch with their family and relatives. Addiction and irrelevant use of social media is a main reason for peer rejection and absence of close friends in adolescents. A five yearlong study in the United States of America found that the heaviest social media users feel less content, often feel bored and sad, and usually report of online problems like cyber-bullying, sexting, relationship abuse, and infringement of privacy. 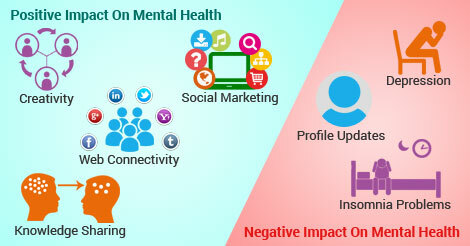 21% teens with social media addiction has been reported to have depression and insomnia problems. Girls experiences more negativity from social media as they as constantly compelled to look good and stylish in their profile pictures and updates. Features like ‘Bum’ pages on Facebook openly allow taunting and teasing.